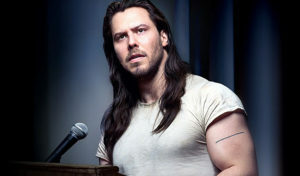 Earlier this year, rocker Andrew W.K. embarked on his first national speaking tour. Dubbed The Power of Partying, the tour includes stops in all 50 states and offers “an intimate celebration of discussion.” Each show features a speech on living the party life and includes an open question and answer session as well as a chance to meet the man. W.K. promises to deliver “a pep rally for the inner spirit, and an optimistic look at the overwhelming intensity of life.” This year marks the guy’s tenth year as a “party guru” and motivational speaker. We talked to him while he was driving to a stop in Wyoming. The tour started last month at the Revolution Brewing Tap Room. What was the first date like? The event was the most successful so far. It sold out in about a week. It was very encouraging and very surprising to get that kind of response. It was an enjoyable experience because it’s a unique venue, especially since it’s called “Revolution.” It was also with a spirited group of people I’ve worked with before. Chicago has been an ever-growing and reliable source of party power since the beginning. I was lucky enough to get to start the tour there. Talk about when you started to develop a philosophy for living. Was it in your teens or your twenties or later? I jut pieced it together over time. I figured out how to live by going through the process. In my situation, trying to explain myself in interviews and on stage has been tremendously helpful. It’s given me a chance to formalize the elusive feelings I have. The one last night. The next one will be tomorrow night. When you recorded “Party Hard” did you anticipate it would become such an anthem? Absolutely not. In the most amazing and humbling way, I realized that everything I’ve gotten to do was launched by that song—not in my creation of it but in people’s acceptance of it. That song was the rocket that launched this trip. That song made me what I am today. People responded and we built this together. You once gave a four-hour lecture at NYU. What was that experience like? Dizzying in the best way. I had never gone to an event like that, even as an audience member. The apprehension and terror that preceded it was greater than every other experience I’ve had. Even the invitation was mind boggling, especially since it came with the insistence that I focus on life itself. I thought it would be they type of lecture you get in a music business class, but they wanted me to talk about life in general. They said I could make it as freeform as I wanted. That I could even get away with it was mind blowing. Six hundred people showed up. It changed everything. I realized there are whole other avenues that partying can open up. There is nothing as direct as music in terms of amplifying that feeling, but talking about life is good too. Did you prepare tons of material? I prepared nothing. The only way for me to get to the heart of the matter is to get there each time fresh. Over the past ten years, I thought about taking notes or even having bullet points but there’s something about the vulnerability and fear of being in the moment that I like to embrace. You say you would like to find truth through partying. Explain how that might work. In my limited experience so far, the truth is that there is no truth. Even that is not true. That’s not a pointless paradox. It reveals an essential value. It’s the engagement with that unsolvable riddle that gives life its meaning. Maybe through that not finding it you’ve actually found it. I like that clarity of confusion and focusing on the blur. Your tour comes in the midst of a presidential election. Do you have a favorite candidate? I don’t like to talk about it. I think it’s being covered so much by more educated and well-versed experts. I feel like if I have something to contribute it is in the realm of partying. A very wise man pointed out to me that politics is society’s interaction with itself. It’s not possible to participate in civilization and not participate in politics. I do realize that. How will fans know it’s really you giving the lecture and not your rumored impersonator? You know, I don’t have any way to answer that. Sometimes, I don’t even know if I’m there as these events are taking place. I don’t know if it matters as long as people come into that room and leave with a sense of encouragement that we can cheer each other on in this intense adventure of being alive.